Some more jet-lagged than others, the three returned to the Getty at 8am to perform short pieces chosen specifically for the cave setting. We filmed their performances and will post them here when edited. 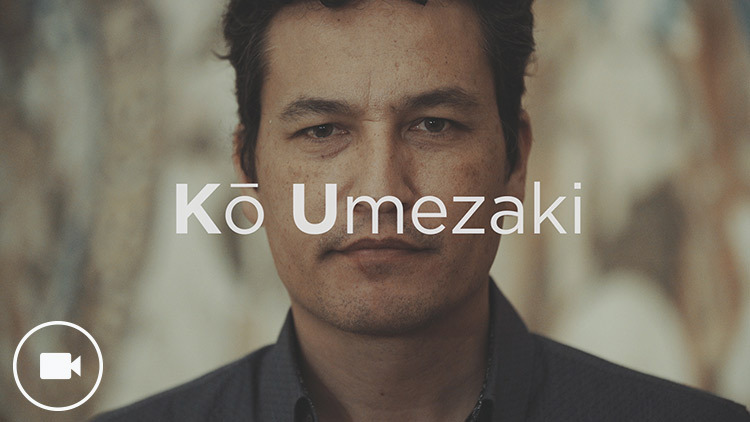 See Ko’s performance of “Empty Bell” in replica Cave 285 here. “I like the idea that just about anybody could go into one of the caves and find a connection to the fabric of their life. I use the word ‘fabric’ on purpose because I’m drawn to the idea of a pattern that repeats. This is a technique that’s used in a lot of music—and certainly used a lot in social media, with the idea of a repeating or looping image. 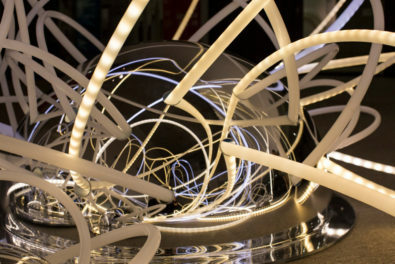 The piece I’ve chosen was written in 1991 by a Hungarian composer, György Ligeti, and is called ‘Loop.’ In that piece he takes a loop of about 22 notes and repeats it about seven times—all with the rhythms contracting and coming closer together. There’s something very rhythmic but also loose in the piece, in the repetition of it; it’s all built on the ideas of 3s and 2s in different combinations. It’s a piece I found myself almost humming in the caves. Well, it’s not really a hummable piece [laughs]—but I was thinking about it. 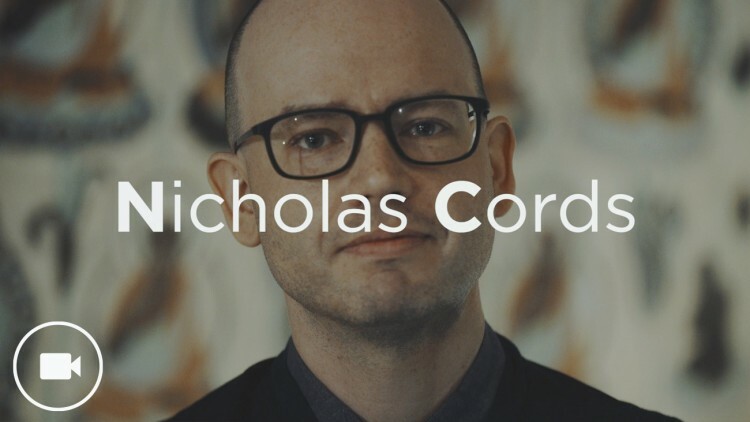 See Nick’s performance of “Loop” by György Ligeti in replica Cave 320 here. “I play the tabla, which is a percussion instrument. Of course all these caves include so many things that I’ve literally grown up with. One of the major images in Cave 285 is Shiva and Ganesh on one side, and Vishnu on another. To me the blurring of lines between what is Buddhism and what is Hinduism is so obvious. It’s just amazing to see them all there—the same names, just looking different. Hear Sandeep Das discuss and demonstrate sacred rhythms on the tabla here. 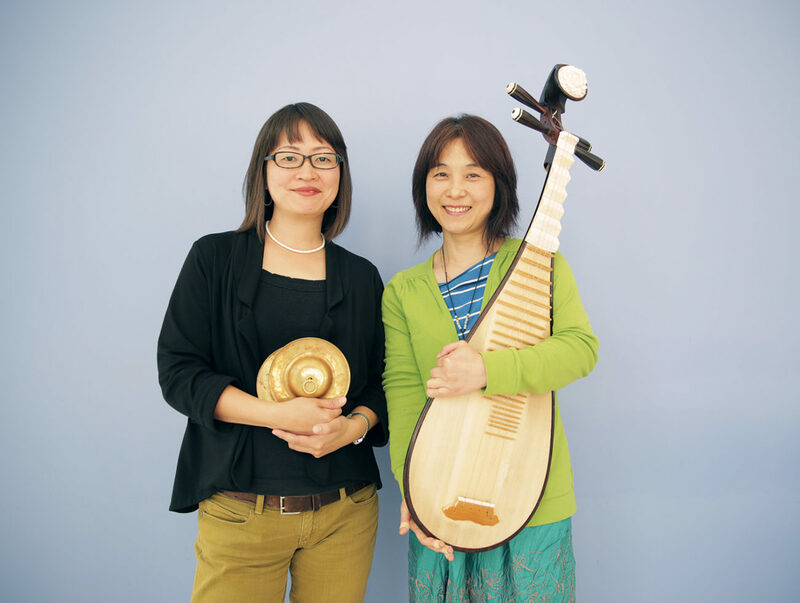 Wu Man plays the Chinese pipa (four-string lute); Haruka Fujii specializes in percussion. They visited June 14 and 15. 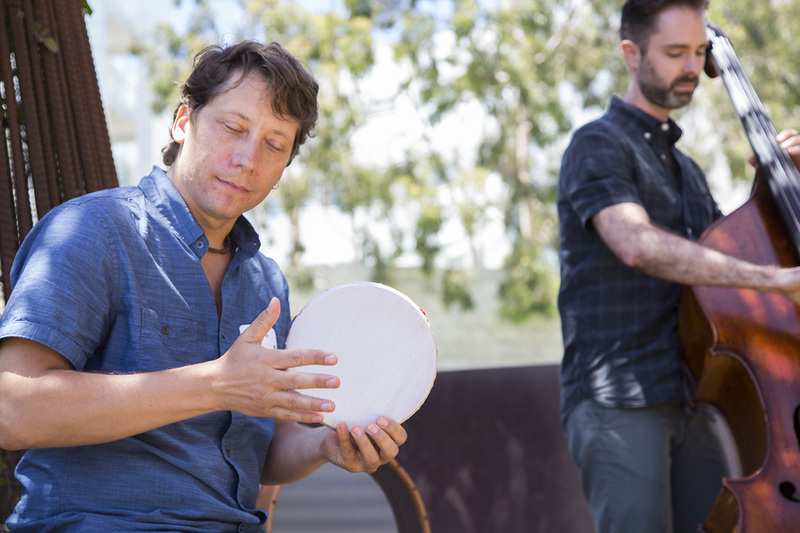 They toured the replica caves and the exhibition, then teamed up to offer a duet on chappa, a Japanese cymbal, and pipa, a Chinese four-stringed lute. 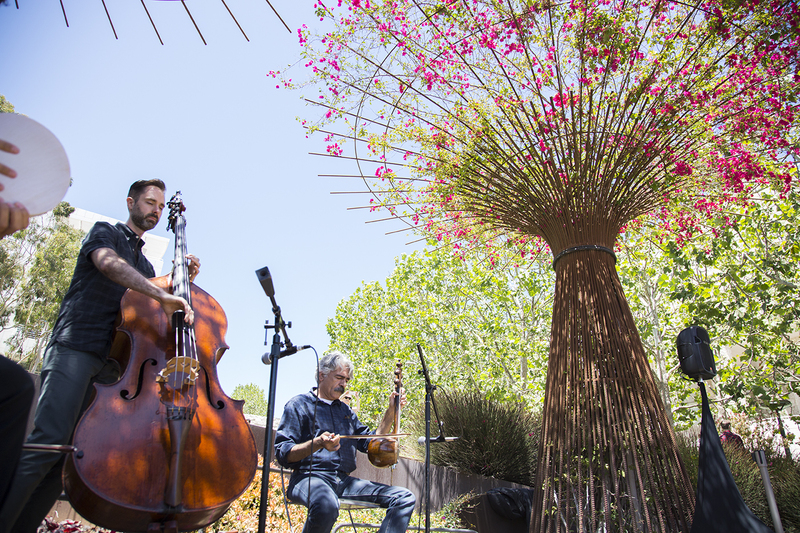 The next day, their public pop-up performance began with a literal clang in the Museum Entrance Hall and concluded downstairs overlooking the garden. For their video concert in the replica caves—which is being edited now and will be posted here on The Iris soon—Haruka and Wu Man chose to improvise music for pipa and gong together in the replica of Cave 275, which had a strong pull for them both. They called their new composition “Feitian” (in Japanese, “Hiten”)—after the Apsaras (female supernatural beings) that appear in the wall paintings of Cave 275. 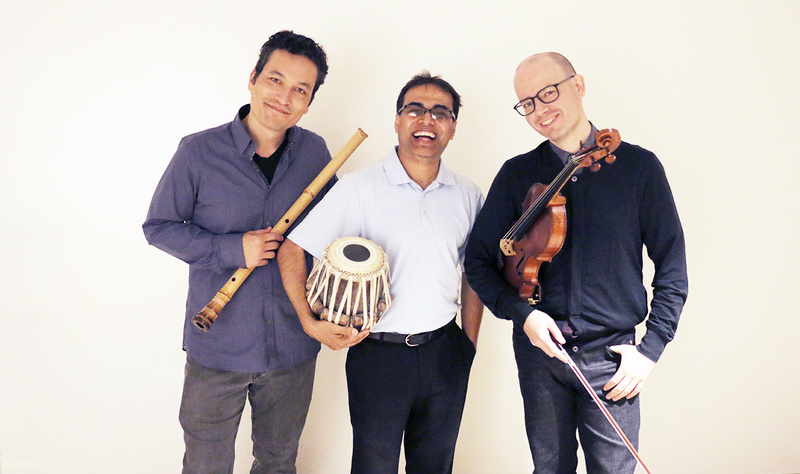 “I’ve played this piece so many times, and every time I play it, I try to imagine what these angels look like, and even try to move the instrument like these hiten. When I heard that the Silk Road Ensemble was having a residency at the Getty, I couldn’t believe I would get to meet these Buddhist angels with my own eyes. When we performed in the caves, I wanted to do something that relates to this personal story. We decided to adapt “Hiten-Seidō,” which starts out with a drum. You start hearing, seeing the hitens, angels, flying around. With our own instruments we added our own color to it, improvised, and made a conversation. An incredible morning performing in the replica Dunhuang Caves at The Getty with Wu Man and Haruka Fujii. 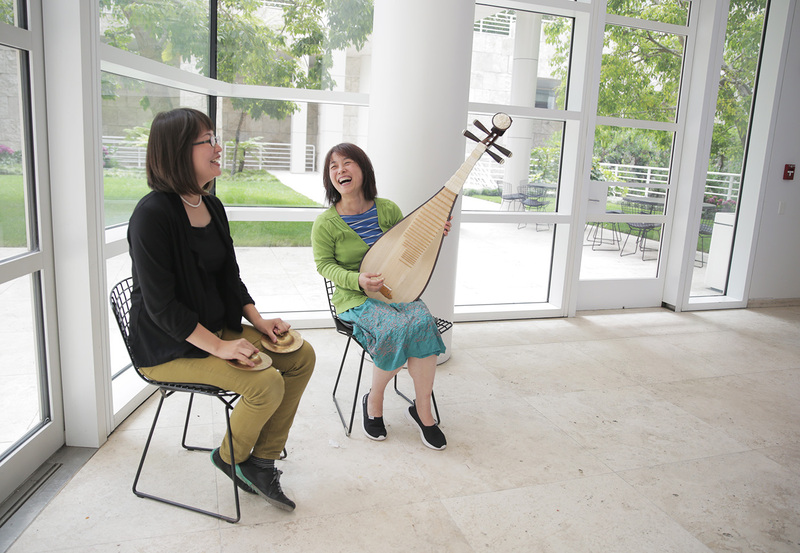 Wu Man’s instrument, the pipa, also has a direct connection to the Dunhuang cave temples, which she has never visited in person. Some of the earliest recorded melodies for the instrument were found in the Dunhuang’s Library Cave, and wall paintings in other cave temples depict musicians acrobatically playing the lute behind their backs. 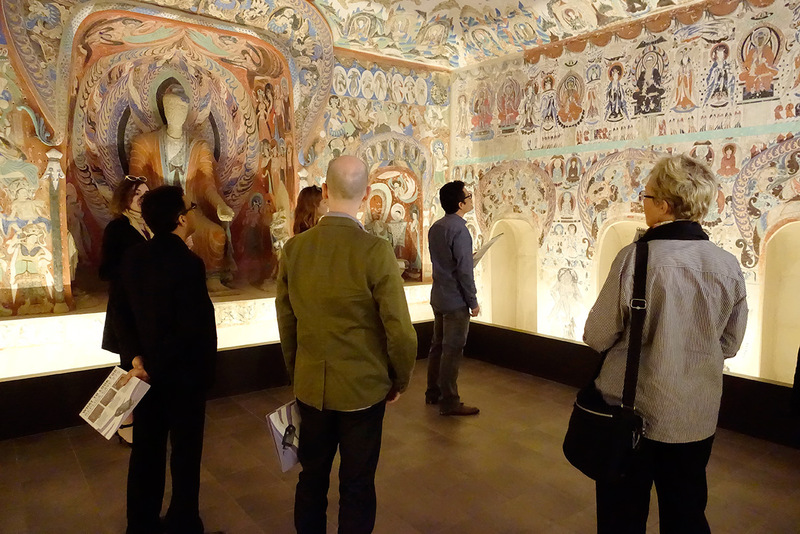 “The Dunhuang caves have a lot of meaning in Chinese culture. We have them in our minds, in our hearts. A lot of early pipa music came from those caves—actually, pipa music started there. It has a lot of meaning for me, as a person, as a musician, as a pipa player. When I walked in [to the replica caves] with Haruka, we both immediately felt something touch us. I saw the pipa figure there, I saw the feitian, which we call the flying goddesses. Pipa history books always mention this—when they show how old the instrument is, they always mention those figures. I felt like I was in a dream. See Haruka Fujii and Wu Man’s performance in replica Cave 275 here. Kayhan Kalhor plays and composes for the kamancheh. He visited with bass player Jeffrey Beecher and percussionist Shane Shanahan on July 13 and 14. 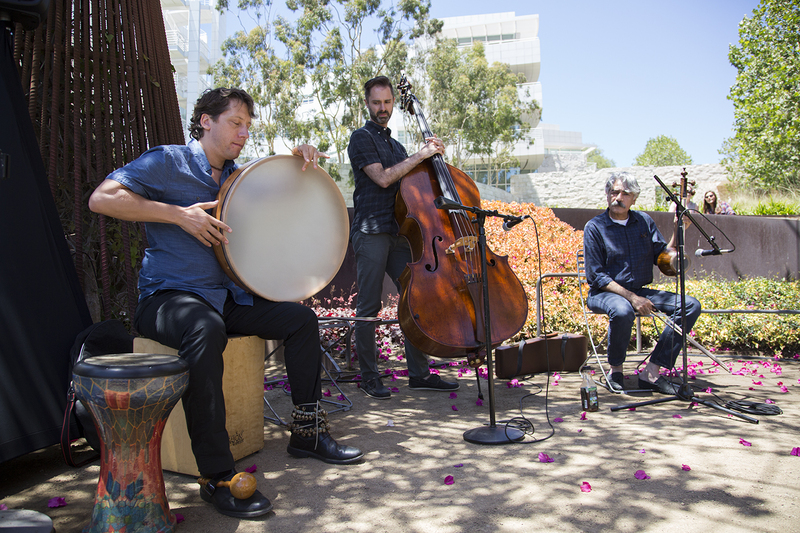 The three explored the cave temples, visited the exhibition, performed for a group of middle schoolers, and played in two pop-up performances in the Central Garden. 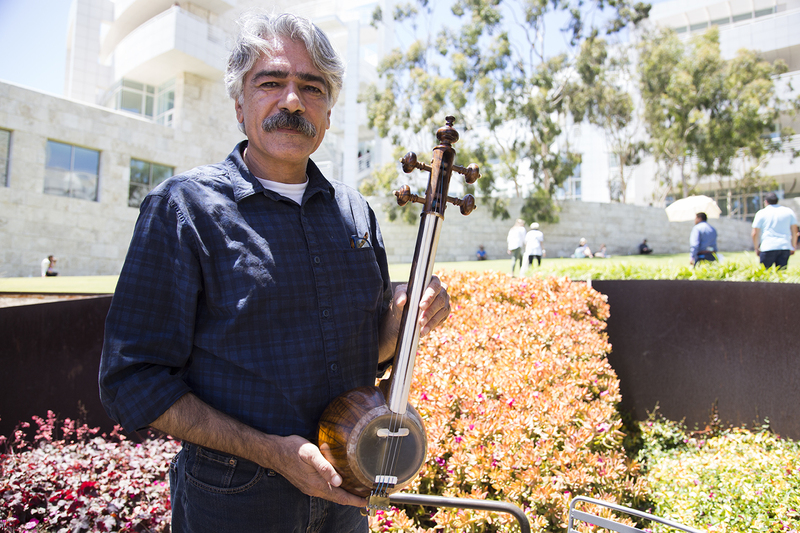 Kayhan Kalhor plays an instrument with roots in Persia, the kamancheh. How did he come to choose it, we asked? 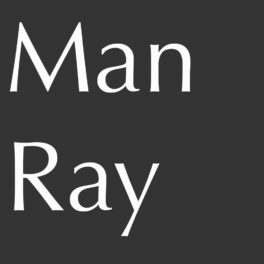 Fascinated with human beings and our search for meaning, Kayhan felt connected to people from hundreds of years ago as he entered the replica caves. He was particularly inspired by images of the underworld, the present world, and heaven in Cave 285, where he performed for video. 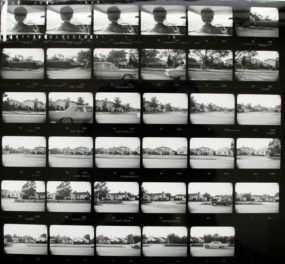 “People come to this world always thinking of something else that exists out there. They try to work on themselves, try to elevate their own spirits to religion, to ideology, to whatever they can relate to. And what strikes me about the replica caves is that how close we are still as human beings and how the way we think has not changed during these past centuries. I tried to improvise a piece that’s somehow in relation to that, to that desire to understand our creation on a spiritual level. 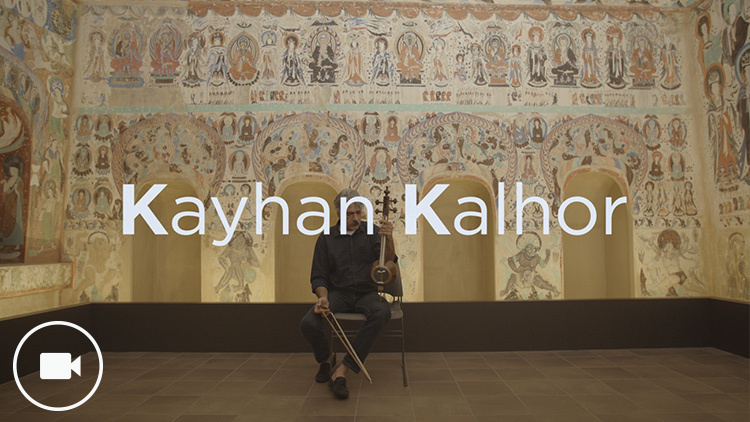 See Kayhan’s performance on the kamancheh in replica Cave 285 here. 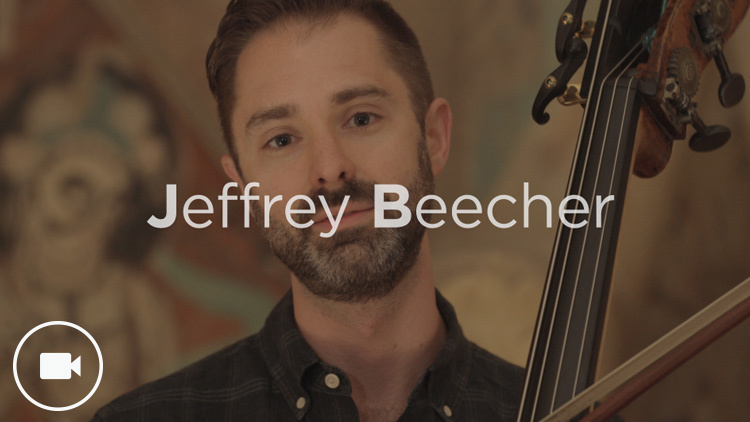 Jeffrey Beecher plays the double bass. The two instruments he plays most often are special: one is from 1790, made in Italy by Giovanni Battisti; the other is from 1850, made in Paris by Jean Baptiste Vion. Both of these instruments were once owned by Vion, and now Jeffrey keeps both together, a reunion after they were separated for about 200 years. And for Jeffrey, playing in the replica caves was an opportunity to imagine what life was like in Dunhuang. He imaged what the people passing through on the Silk Road were feeling, and channeled that in his performance. “I played a piece that’s very introspective. It’s a prelude to four short pieces by a contemporary Dominican composer. I imagined what it was like for people on their journeys hundreds of years ago. See Jeffrey play a composition by John Anderson in replica Cave 285. “I chose to play a large frame drum that was inspired by the pair of thunder gods depicted in Cave 285, up on the ceiling. Each one of them is surrounded by a circle of drums, and they’re playing with their hands and their feet. The drums that they’re playing look very similar to the frame drum, just a simple circle. That inspired me to think about the sound of thunder, and what it must have sounded like in those caves themselves. 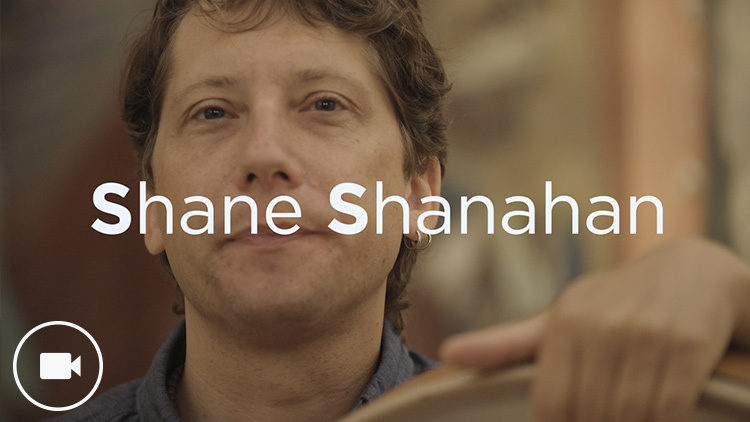 See Shane’s improvised performance in replica Cave 285 here.